[UPDATE Dec 17: Election Results] The incumbent Glenn Blakeney [PLP] has defeated challenger C. Anthony Francis [OBA]. 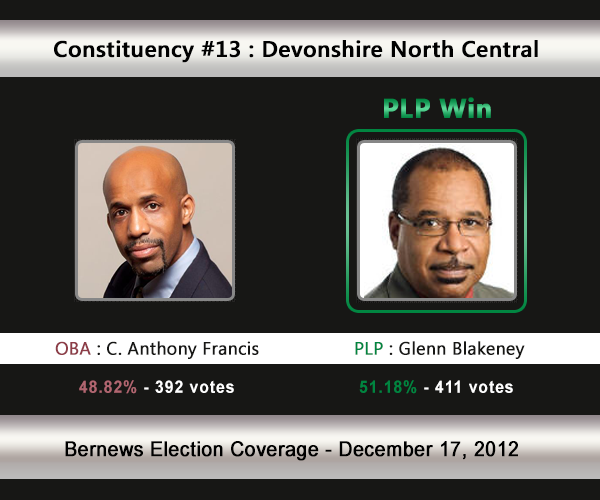 Constituency #13 Devonshire North Central will see the OBA’s C. Anthony Francis challenge the incumbent Glenn Blakeney [PLP]. In 2007 Mr Blakeney won 53.52% of the vote vs the UBP’s Albertha Waite [433-376] in 2007. In the 2003 General Election, Mr Blakeney won with 57.22% of the vote against Hilary Soares [UBP] who received 42.78%. 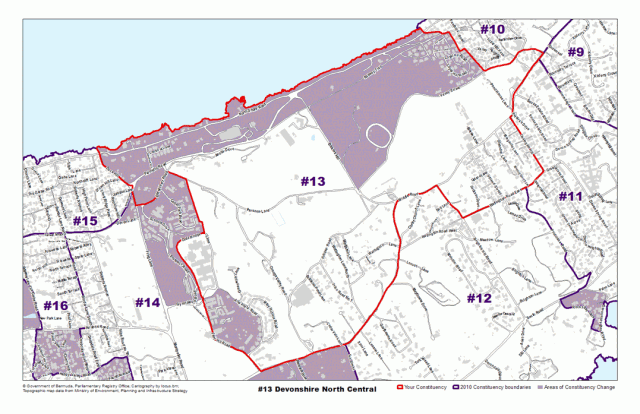 The areas the Devonshire North Central constituency consists of, or is located by, include Old Military Road, Parsons Lane, Palmetto Road, Barkers Hill, Middle Road, Chaingate Hill, Watlington Road East, Brighton Hill Road, Fort Hill Road, Alexandra Road, Cedarbridge Lane, Frog Lane and more. Glenn Algernon Blakeney is the sitting Member of Parliament for Constituency 13, Devonshire North Central. He is committed to working hard in service to his constituency and for the common good of Bermuda and its people. A community leader and entrepreneur, he is the Founder and President of Inter-Island Communications, Ltd., the parent company of Bermuda’s two most popular radio stations, HOTT 107.5 FM and MAGIC 102.7 FM. In 2010 he founded “Bermuda Soul Record Company, Ltd.”, which is devoted to launching the professional recording careers of Bermudian musical talent. He was first elected a Member of Parliament in 2003 and then reelected in 2007. He was subsequently appointed a Cabinet Minister with responsibility for the Environment & Sports. In mid 2011, Mr. Blakeney’s ministry was realigned and he now holds the portfolio of Minister of Youth, Families and Sports. As Minister responsible for Sports, he spearheaded construction to complete Bermuda’s only Olympic sized 50-meter swimming pool and multi tier dive platforms at the National Sports Centre’s new Aquatics Facility. Additionally, Mr. Blakeney piloted legislation bringing Bermuda into compliance with the World Anti Doping Association’s (WADA) commitment to Drug-Free sports both domestically and internationally. Other notable legislation piloted by Mr. Blakeney includes the “Youth Empowerment Scheme” (YES), designed to provide employment to eligible youth who will “learn while they earn” and the “Human Rights Unreasonable Hardship” legislation which will help ensure reasonable employment accommodation for those physically and otherwise challenged without unreasonably burdening prospective employers. He has worked tirelessly to effect timely resolutions in response to constituency concerns. During his tenure, Mr. Blakeney has succeeded with having roads resurfaced in the Cedar Park, Alexandra Road and the Mary Victoria Road areas of Prospect. He was also responsible for having street lights erected in his neighboring constituencies, which additionally includes working directly with Prospect Primary School to have new perimeter fencing installed around the playing field and a new bus shelter constructed at the school entrance with the invaluable assistance of Public Works, which now protects students from inclement weather and allows them to access the bus without having to leave school property. He was the first elected representative to have Closed Circuit Television (CCTV) cameras erected in any constituency, when he successfully secured a private security firm to sponsor the surveillance equipment, which he strategically had installed just inside the entrance of Alexandra Road to deter the suspected “untoward activity” that was brought to his attention by area residents. Mr. Blakeney is married to Gwen. He is the father of five children, and grandfather of nine. Anthony’s commitment to Bermuda’s youth runs deep, not just as a father of three children, but as an avid sportsman involved as both an executive member of the BFA and as a former president of the Bermuda Referees Association. Anthony believes the OBA has the desire to include the young and readily teach the next generation. While he knows the task of correcting the ills that have encompassed the island is by no means simple, he isn’t content to hope for change, but rather he intends to be part of creating the change for the whole of Bermuda. A firm believer in openness and transparency, and a resident of Devonshire for some thirty-four years, Anthony Francis is the approachable candidate the constituents of Devonshire North Central can look forward to dealing with in the future.